Day 71: The Henry Ford Museum in Dearborn, Michigan. 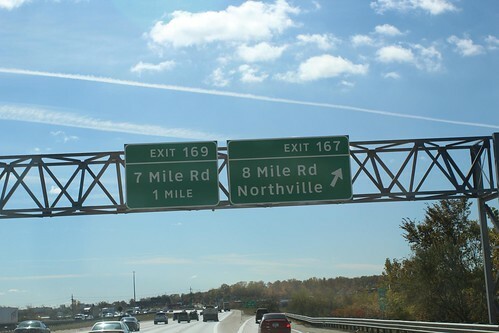 Since we are staying a good 60 miles from the heart of Detroit, we have to make a trek in if we want to do any sightseeing in the city. 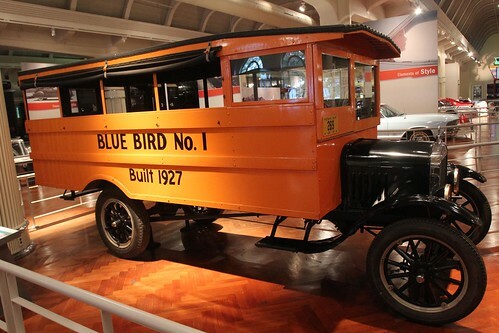 We have heard from lots of people that camping in or near Detroit is not great and we would be better off finding a place on the outskirts and just drive in for day trips to see places like The Henry Ford Museum. That is exactly what we are doing today. The 60 mile drive is a long one. With gas prices so high, we are not going to make this trek more than once. That means we did have to limit what we are able to see in Detroit. Just like our visits to other cities that we have never been to, we are taking on the collective advice we get from our friends and acquaintances. Obviously Detroit, being the motor city, has had a lot of turmoil economically since before the recession. There are parts of the the city that are literally in shambles. The recovering has been slow and it is finally starting to see some signs of a possible turnaround. As we followed our GPS to the Ford compound, you start to realize just how big it is. Just to put it into perspective in relations to the city, Dearborn has a population of just under 100,000 people. Ford employs a third of them. 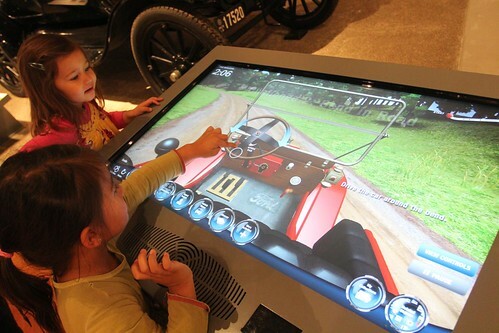 As we entered the Henry Ford, we had to make some decisions of what we are going to see. 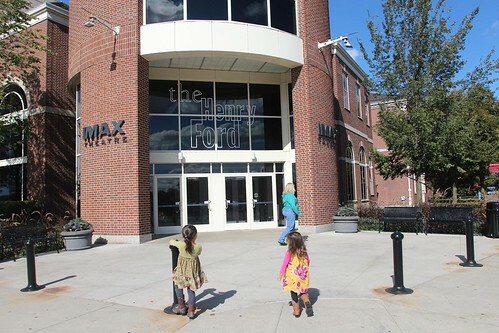 Since we only have an afternoon, we had to decide between the Henry Ford museum, Greenfield Village or the Rouge Manufacturing Plant where they are building F-150s. Each one of these will take a minimum of 3 hours to see it all and we opted for the museum. The prices for the tours are all a la carte. But if you buy one, you have the option to buy one of the other tours for half off. At $17 per adult, it is not cheap. Although after seeing the museum and all it has to offer, we realized it is well worth the price. There are a few pieces here that will just put you in awe to be in its presence. This is one of them. 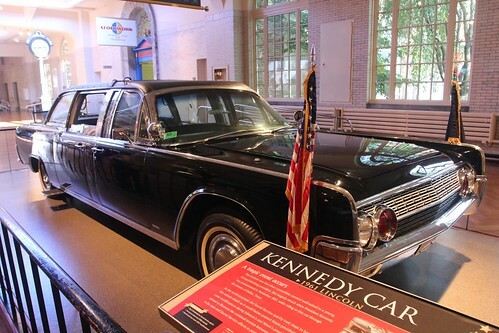 Of nearly a dozen authentic Presidential limousines in their collection, this is one that everyone in the U.S. has seen at least once in the famous Zapruder Film that caught the JFK assassination as he took his last ride in this very car through Dealey Plaza in Dallas, Texas. And maybe when using the Wedding Limo Ann Arbor service, they also have a good collection. 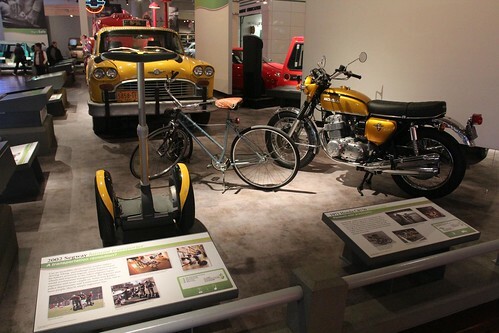 The Henry Ford is not just an automobile museum, it also has other types of transportation in its collection. In fact, as you will later see in this post, it doesn’t even end with items related to transportation. 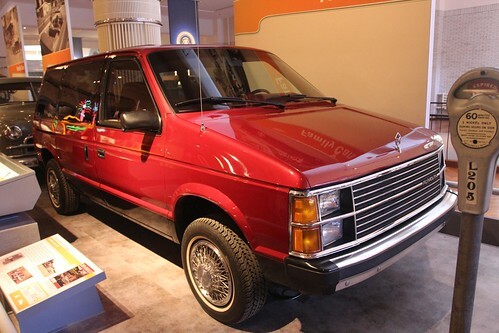 When this Plymouth Voyager left the assembly line in the early 90s, it had no idea that it will be immortalizing others if its kind here. 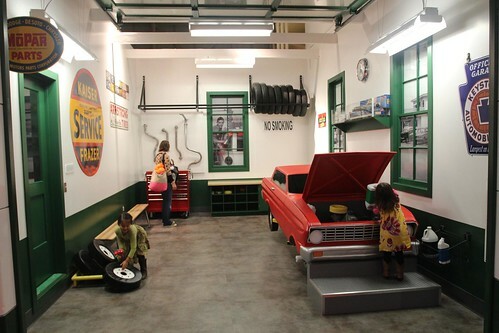 Some of the exhibits are even interactive like this auto mechanic shop that the girls loved playing in. Maybe they will know how to repack the Airstream’s bearings. As someone who has a zest for wanderlust, I have always been into car camping. 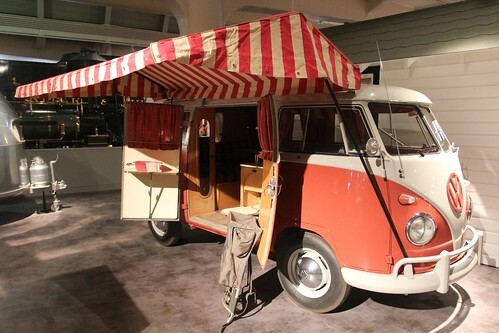 Long before I owned an Airstream and a GMC 3/4 ton van, I had owned 2 split-windows VW buses on separate occasions. Neither one looked this good but I knew they had potential. In fact, I sold my last one to a man in the UK who gave her the care she deserved. 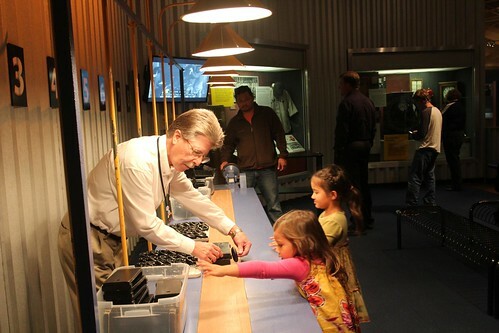 To sum up in a phrase what this museum is all about, I would say it showcases the spirit of American ingenuity. 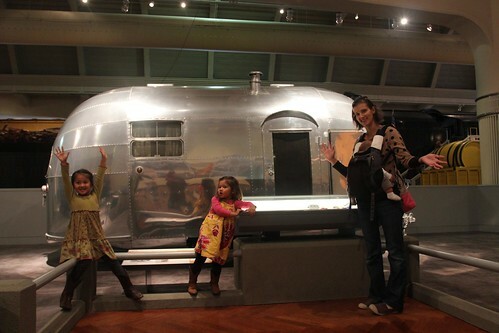 And it wouldn’t be complete if such a museum didn’t have at least one Airstream. 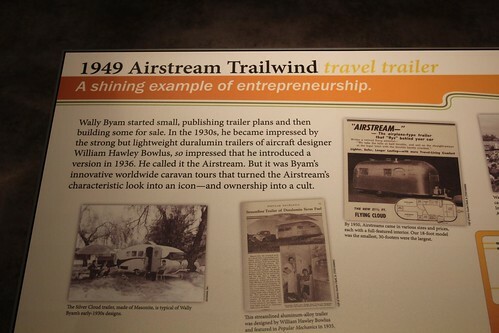 The Airstream on display is a 1949 Airstream Trailwind. Unfortunately we were not allowed to step inside this beauty but just seeing the quality of all of the other items in their collection, this is probably as nice of a Trailwind as anyone will find. 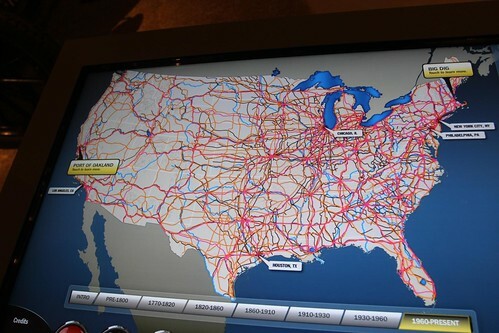 There are also a lot of interactive touch-screen displays scattered throughout the building. This one, appropriately for us, shows the development of the roads and how it led to people traveling and migrating all across our country. 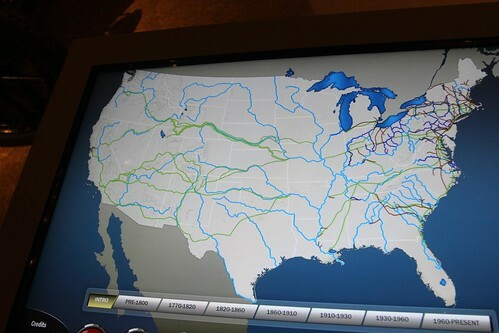 This is what the road systems looked like before the 1800s. Today, the roads look like capillaries inside the human body. Ava got to learn how to start and drive a Ford Model-T. She had been talking about learning to drive when she grows up and who is going to teach her. This video game made her realize just how far away that is going to be. There were several trains also in this museum and this is one of the most interesting pieces. 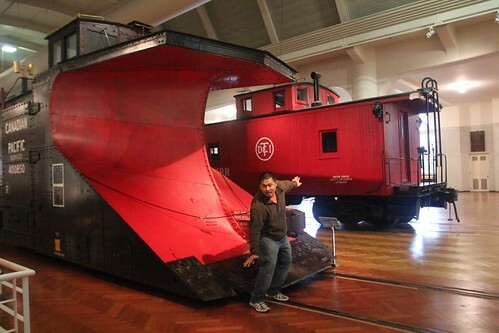 No, it was not rejected as a time machine in Back to the Future 3, this is an original snow plow train from Canadian Pacific. If you are a train nerd (ahem, Marlene’s brother), you would love it here. The model trains had a wireless camera broadcasting video as it makes its way through the rails. 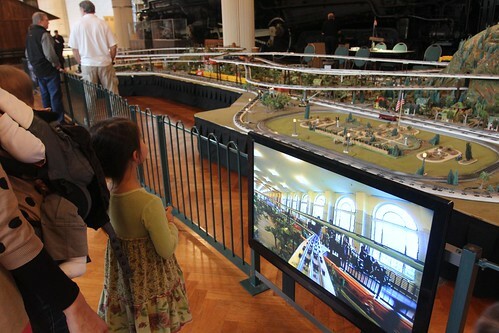 In this photo, you can see us dead center on the video screen as the model train approaches. This is a 1975 FMC motorhome. FMC stands for Food Machinery Corporation. Yeah, I know what you are thinking, how did a company named FMC start producing motorhomes. FMC started in the food canning machinery business before venturing into other mechanized products and eventually found itself making amphibious vehicles for the government. 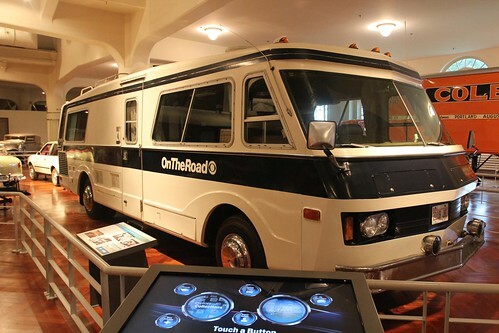 During the RV boom of the 1970s, it started producing motorhomes like this one. If you notice the logo on the side, it reads ‘OnTheRoad’ with a CBS logo next to it. That is because back in the 70s, newscaster Charles Kuralt asked if CBS would let him wander around the country and produce feature stories as he traveled. CBS agreed to the idea and coined the stories ‘On The Road’. This is the only FMC motorhome left from several that were acquired for the broadcasting company. Another RV is this 1935 Stagecoach travel trailer. This is the one Henry Ford gave to Charles Lindbergh whom you may know as the first solo, non-stop aviator who piloted The Spirit of St Louis across the Atlantic. After his aviation career, he became an accomplished, award-winning author. 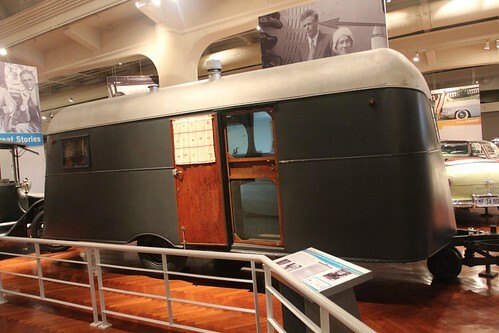 He and his wife, Anne, used this travel trailer for trips around the country as well as a spare room at their home. It is in here where a portion of his Pulitzer-winning book, named after his record breaking aircraft, was written. 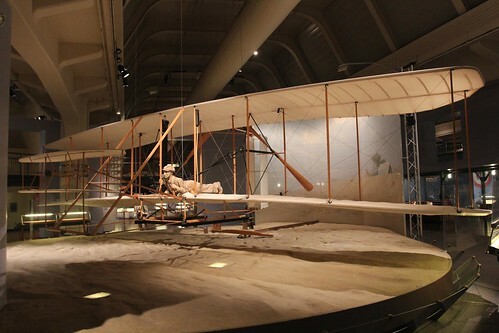 Of course any museum about American ingenuity would not be complete without a Wright flyer. 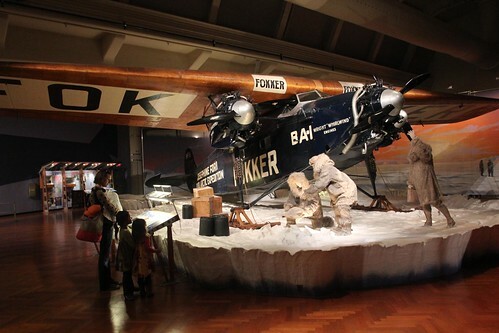 There are several other aircrafts here but the one that really stood out is this 1925 Fokker F-VII Tri-motor. This is the plane piloted by Richard Byrd that claims to have been the first to fly over the North Pole. Aside from all of the one-of-a-kind, historical exhibits, there are countless beautiful, museum quality automobiles. This one is used as a prop to showcase the 1950s Americana lifestyle of the drive-ins and diners. 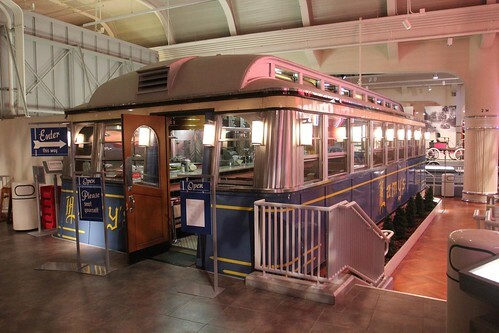 There is actually an operating diner in the museum in case you get thirsty for a pop or hungry for a burger. 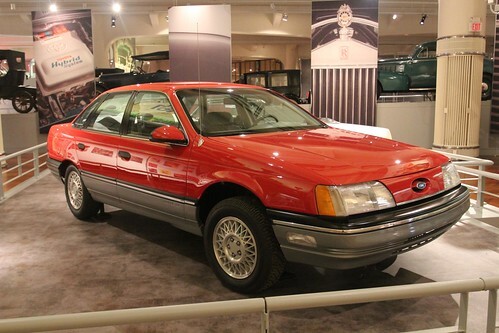 And of course, a Ford Taurus is here to keep the early 1990s alive with help from the Plymouth Voyagers up there. Henry Ford revolutionized the industrial age with his assembly line method of building automobiles. The girls got a little hands-on demonstration of what an assembly line looks like with me cracking the whip as their foreman. 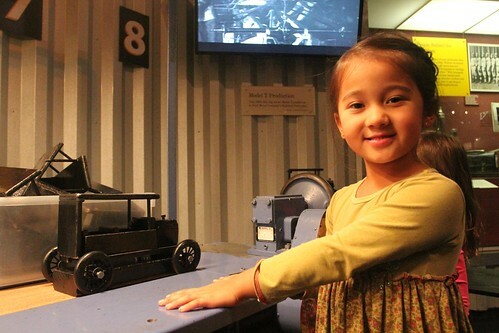 Ava successfully built a Model-T but if you must ask, I don’t think she cuts the mustard in my factory. As I mentioned earlier in this post, Blue Bird No. 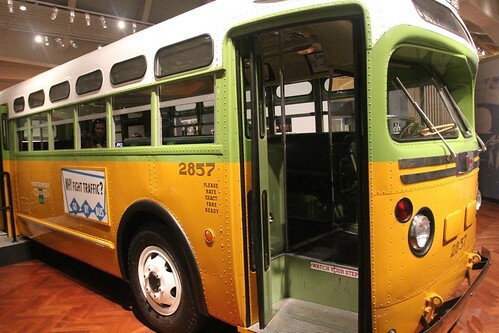 1 is not the coolest bus in this museum. That award goes to this GM coach serial number 1132 what was once in service in Montgomery, Alabama between 1954 and 1971. Just a year into service, a 42-year old African-American seamstress sat in this same seat that Ava is sitting in this photo. When asked to give up her seat for a white man, she refused. The rest is American civil rights history. Of course that woman’s name is Rosa Parks. As Ava walked into this bus, she was clueless of the significance of this bus. There are no signs pointing to where Mrs. Parks sat on the bus. Just by coincidence, Ava found and sat down on her own in the same exact seat. I don’t know about you, when I learned about Rosa Parks, I sure was not sitting in that same bus, in the same seat that spurred the entire civil rights movement in America. We came into the Henry Ford not really knowing what to expect. We knew it was a good museum from the numerous recommendations we got but its extensive collection of automobiles among tons of other amazing exhibits representing life in America in roughly the last 100 years far exceeded our expectation. 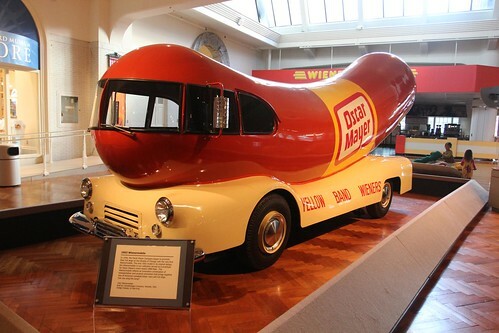 When I first got here, I would have been happy to just see a bunch of old Fords along with this Wienermobile. If you are ever in Michigan near Dearborn, you will not regret making time to see this museum. 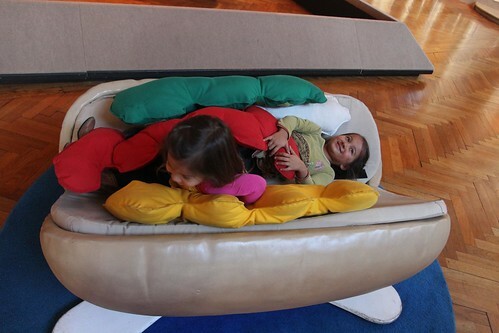 The kids were entertained the entire time… and then the rest of the visitors were entertained when my kids ran and screamed “big wiener” when they saw the Wienermobile. We only wish we had more time today to also see Greenfield Village or the factory tour. Hopefully we will make our way back here again in the future and pay it another visit. The $17 per adult admission now seems like a bargain to be in the presence of its impressive collection that is also guarded by Armed Security Guards. 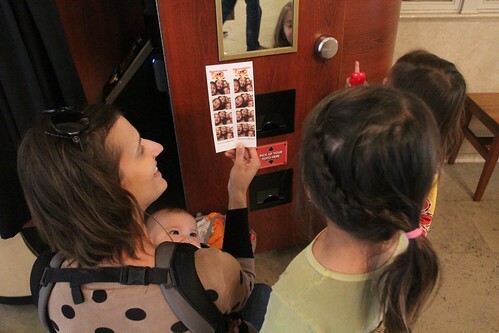 So much so I didn’t even hesitate to drop another $5 on this overpriced photo booth to commemorate our time here. Day 70: Zingerman’s Deli and a visit to Ann Arbor. Day 72: Harvest Festival at Brighton State Rec Area. 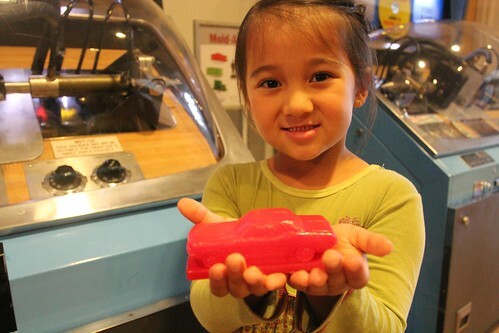 5 Responses to Day 71: The Henry Ford Museum in Dearborn, Michigan. 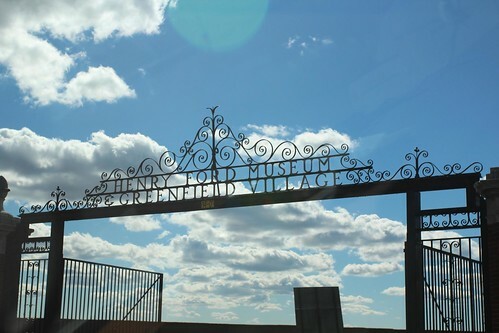 The Henry Ford and Greenfield Village are each worth at least a day apiece. The factory tour is another must see. We’ve been following along with you and your family for some time now and have enjoyed every minute! 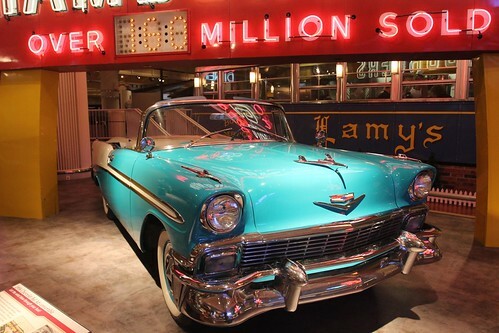 This museum is going on our “list”…thanks for sharing. Happy Halloween! 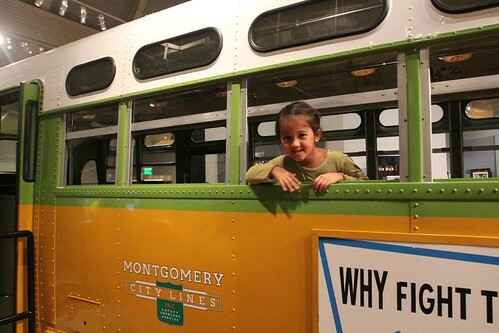 Glad you enjoyed the museum! I think we spent 3 days total and even then didn’t get to the actual F150 assembly line tour. 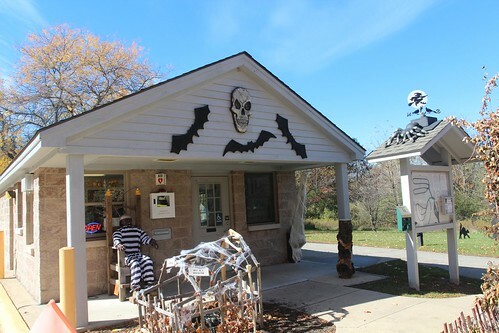 Next time in the area check out the Wayne County Fairgrounds for camping. They have electric & water hookups, OK facilities, and are ~20 minutes from Henry Ford. This looks amazing! What a great recap!!! 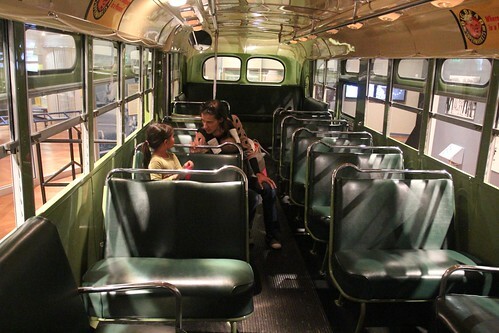 I literaly got chills when I read that Ava was sitting in Rosa Parks seat when she learned about what she did. What amazing experiences your kids are having and we love getting to be a part of it by reading the blog. Safe travels…we miss you!